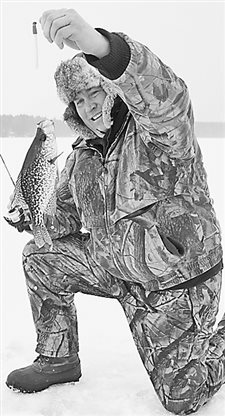 Just when anglers were getting around on the ice well and preparing for a good finale to the ice fishing season, the North Woods got more snow last week. Things out there will now be a slushy mess at least for a few days. Who knows what the ice conditions are going to be this week, with the warmer weather having reduced the ice somewhat, but colder weather in the forecast. Well, we’re getting ever closer to an actual spring, as the general weather trend is for warmer weather starting later this week. It sure didn’t seem like it last Saturday, but that was just a reminder of winter. Be patient, my friends. We’re getting there day by day. We’ve had some really nice weather over the last week and hopefully more to come — sooner rather than later. There is not much ice fishing going on at this point as the ice conditions have been as bad the past month as they will ever get up here. However, this warming weather is a delight (except this writer is dealing with some moisture in the basement) and it means much nicer things to come. 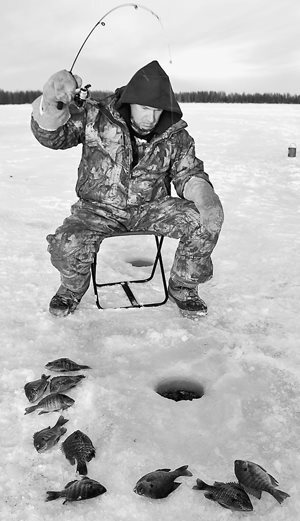 For those of you who don’t like to ice fish on crowded lakes, you are in luck. Pick any lake in the area and chances are you will not see anyone else out there! Very few anglers got out on the ice for the last weekend of the game fish season. The snow and slush on the ice are keeping most people away. Wow! That’s all we can say about the weather last weekend. There is a lot of snow on the ice now, and it is next to impossible to figure out when anglers are going to be able to get back on the ice. The North Woods sure has had enough snow for a while, but it was great to see all the winter sports going on last weekend. We now have significantly different conditions on the ice, as the snowfalls have unfortunately created significant slush out there. Much better weather over last weekend brought out a large number of ice anglers and they had a fair amount of success on the ice. There sure weren’t too many ice anglers out with this horribly cold weather last weekend. It is the time of the year when we always seem to have this cold weather, no matter what it has been before this. The recent colder weather has thickened the ice and made it easier to drive on many lakes. This has been a good winter to get around out there. Our January weather has in actuality been pretty mild, with very good ice fishing weather and very good ice fishing conditions out there. 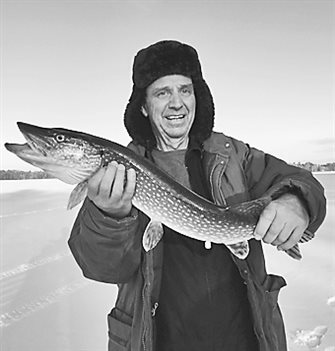 It has been a tough winter so far with poor snow conditions for skiing and snowmobiling, but the ice fishermen love the ability to walk easily on all lakes. The 4-inch snowfall Sunday and Monday should help the conditions for outdoor recreation enthusiasts. 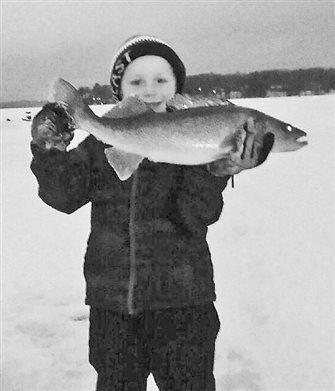 The last several weeks have produced some pretty good ice fishing, as the ice has thickened and anglers can get around to all depths on lakes. The only places to use caution now are the current areas on the Chain of Lakes. Some colder weather again after the warm spell has firmed up the ice again and made conditions for ice anglers very good. The North Woods has had some warm weather lately, which has felt good but not helped the snow conditions. The North Woods is certainly heading into a nice weather period, along with increasingly better ice conditions. Lakes probably average 7 to 8 inches of good ice now and that is pretty comfortable for everyone. A full dose of winter has arrived, with some snow and much colder weather in the forecast for later this week. 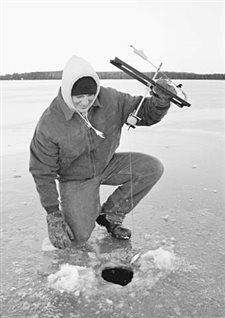 The beginning of any fishing season can be somewhat of a crapshoot, especially the ice fishing season with a variety of ice conditions each year. 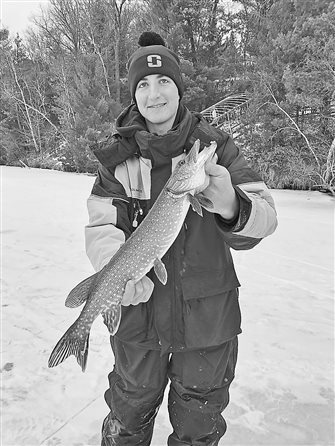 The open-water fishing season has come to an abrupt end, with much colder weather than the North Woods had last year at this time. The last week has brought about tremendous change in this area, as we have now had a fair amount of icing on the smaller lakes and are done with the open-water season. This happened amazingly fast and is pretty early. With the end of fall right around the corner, fishing with boats is winding down — especially with frigid cold weather in the forecast this week. There are a few walleye anglers out there and, of course, those die-hard muskie guys, but that’s it. The muskie fishing season closes Nov. 30. 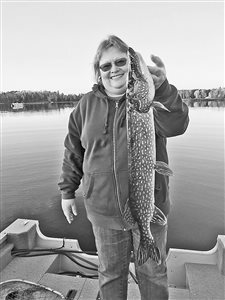 The North Woods has had a warm-up from several weeks ago and it has made for much more pleasant fishing conditions. North Woods lakes have very suddenly moved into the late fall patterns, as the water temperatures are solidly into the mid-40s on all lakes. The temperature drop was very fast, and has resulted in good walleye fishing in the area, especially on the Eagle River Chain. Rapidly changing weather has sped up the fall process and left much colder water temperatures, along with a whole lot of leaves on the ground all at once. With this colder weather we finally have the process of turnover occurring on many area lakes. Provided there is not a big warm spell, this will last for a little more than a week and the lakes will start to clean up. Fall is here and we’re starting to see some turnover on some lakes. It is very late in coming this year, and hopefully the weather will stay reasonably cold and let that process finish on all our lakes. Weather changes have brought about the water temperature drops that we have been waiting for throughout the area. The last week of hot weather was pretty unseasonable and terrible for our fishing, as the water temperatures went up at a time they are supposed to be falling. Well folks, we are now heading into the fall period in full force as some trees are turning color, especially the birch trees. Ferns along roadways have died off significantly and the soft maples are turning red. Is it midsummer or early fall? It’s hard to tell as the weather has been so hot and humid, yet some leaves are starting to turn. Ferns are turning brown. We have had, as usual, some really hot and humid weather in August. This brings the water temperatures back up on the lakes and justifies the term “dog days” to describe the fishing in the area. Mid- to late-summer fishing patterns dominate the fishing report this week. A cold front moved through last week, dropping the water temperatures 5 degrees or so on the surface. What a summer! We now have temps back in the low 70s on most lakes. Meanwhile, water levels again have been going up on all lakes with all that rain last week. When we get to this time of the year, we start to see some weeds starting to turn brown, especially in shallow water. It’s August already and the summer goes by so quickly each year. Water temperatures are now down in the 70s and dropping, but don’t be fooled. The North Woods could still get an extended warm spell which would move those temps up again. The North has had some rain, but the water levels are dropping. Weeds are still much less than last year, and those that you can find are starting — just starting — to get a little slimy and brown in the shallow areas. All in all, we are in the midsummer slow pattern. The North Woods has had some inconsistent weather recently, making for inconsistent fishing. The water temperatures are going up and down with the weather, which causes the fish to move from spot to spot. That has been a hallmark of this year. You’ll find fish in one spot one day and then the next day they are not there. We’ve also had a lot of rain, which has brought the lake levels up considerably. Water temperatures are back down in the 70s after the cold snap. There will be a lot of boat traffic the next few weeks, so plan your fishing trips accordingly. Evening and early mornings are the best. Midsummer fishing can be a hit-or-miss proposition, and that has certainly been the case in the last week or so. The hot weather has brought the water temperatures up into the 80s in some cases and that is just too warm for this area. The weeds this year are still a mystery, as there are some areas that normally have weeds (and cover) that are just bare. Hot and dry weather is dominating the North Woods weather, making activities in the water exceptionally pleasant. If you are going to fish, we suggest starting early in the morning or evening to take advantage of the quiet and the cooler periods of the day. The weed growth is very strange this year, in that there are areas on the lakes that normally have weeds that are just bare this year. The July Fourth period will bring the maximum number of people to the water this week, so be patient and careful out there. Water levels remain high and the water temperatures are getting quite high with all the hot weather. Weeds are finally growing in a more normal fashion after the late and cold spring. Anglers are heading toward midsummer conditions, with the water temperatures warming and high boat traffic. Water levels also continue to be high. It has been a strange year so far, with temperature extremes throughout the spring. It seemed to be either too hot or too cold all spring. Right now on the Eagle River Chain, the mayfly hatch is in full bloom and it is having a big effect on the fishing. All spawning activity is finished for the year except maybe a few bluegills on some of the colder lakes. It was a year that some fish of all species did not spawn because of repeated cold fronts, which cause the spawners to retreat to deeper water. It feels like the North Woods has gotten a whole summer of rain in the last week. Roads, driveways and basements have all received an unwelcome dose of heavy rain for the last week or so. As a result, the lakes and streams are high and in many cases flooded. The rain has also dropped the water temperatures, which were in the 70s. It’s not a catastrophe, but it has become a mess for many people. As we head into summer, we’ve had a pretty nice weather period. We could always use some rain, but we’ve also had some nice sunny days to enjoy being outside. The fishing patterns have changed a lot, as we transition from the spawning period to summer. The mayfly hatch is on the horizon and that particular hatch will change the fishing a lot, as the whole food chain responds to that. Well, we finally got some significant rain in the last week, bringing up lake levels and completing the greening of the North Woods. That’s the good news. The bad news is that it has brought out mosquitoes in pretty good numbers. If you are planning to spend time in the woods, take repellant along with you. It looks like we are in for a pretty good weather spell with temperatures in the 70s this week, which is perfect for fishing this time of year. What a batch of weather the North Woods had through last weekend — including the warmest weekend in May that most of us can remember. There were a lot of people enjoying the hot weather and the water temperatures really soared over the holiday weekend. This rise in the water temperatures really spurred the fish spawn. 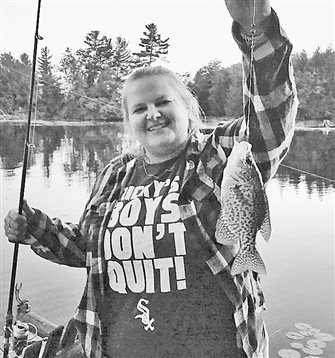 The water temperatures range from the high 60s to the mid-70s on most lakes, bringing bass, bluegills and crappies to the shorelines. The North Woods was also blessed with some heavy rain, especially in Eagle River, which has “greened up” the area and reduced the fire danger. We have had generally nice weather, except for that quick drop in temperature last Saturday afternoon. Nonetheless, it will be summer pretty soon and the warmer weather will increase the water temperatures. This weekend, anglers will see very busy waterways with Memorial Day arriving. Before that drop in temperature last Saturday, we were seeing water temps in the 60s on many lakes. At the time of this writing, it looks like it is going to be a great weekend for all fish species. The North Woods is experiencing some great weather now that the grip of a late winter has been released. Except for the fact that it has been dry lately, the weather is perfect. Lakes remain pretty high despite the dryness due to the snow melt. Water temperatures are now in the high 40s or getting even into the 50s on the smaller lakes. In general, the fishing has been very good despite the later start of spring. Who would have guessed at midweek last week that so many lakes would open by Saturday? The wind and warmer weather took quite a toll on the ice Thursday and Friday. With a warm and sunny weekend, much of the ice — except on the bigger, deep lakes — is gone. Not only that, but the spawning season for perch and walleyes is in midstride. We have water temps up into the mid-40s and even higher on some of the small lakes. Except for the fire danger, this weather is perfect for fishing and for getting some yard work done. Well, we’re getting closer to some good open water fishing with these warmer temperatures, but not close enough. This week’s weather has got us closer, but there has been just so much ice on many lakes that they are not going to be open for several weeks. 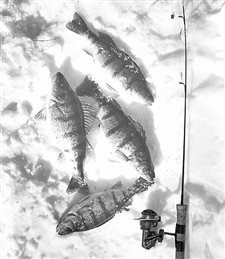 Most anglers have given up on ice fishing because it is so late in the year, plus the fact that it is getting hard to get out onto decent ice with the shorelines melting away. 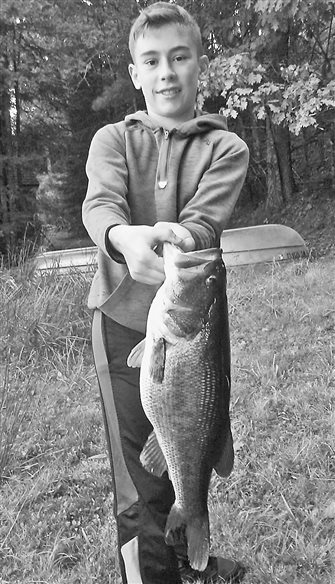 Some anglers use planks or a ladder to get out there, and some wear waders. We certainly feel a little better about the weather now than we did last week when there was 18 inches of snow on the ground. It feels good outside now — almost normal for this time of year. In looking around the area, we certainly haven’t seen too many ice fishermen. It’s so late in the year that most people have given up on ice fishing and are simply waiting for open water. Just when we think that it can’t get any worse, it does. Immeasurably worse. Even though there are some decent days coming, the amount of snow that has arrived is the nail in the coffin for our lakes being open for the opener. To be truthful, this writer is guessing open water throughout the area on the third weekend of the season. We’ll all be stir-crazy by then. The worst part of this is that it is so tough to get out on the lakes that hardly anyone is ice fishing either. We need some really warm weather — and sun — to knock the snow level down to be able to get around on the lakes. And that doesn’t take into account some slush on the lakes. North Woods lakes are, as far as the ice going out, at a complete standstill. As a matter of fact, with the cold nights the ice might even be building up on some lakes. There is as much as 30 inches of ice on many lakes and getting thicker. This at a time when, during many years, the ice is going out everywhere. What a year this has been. Last Sunday had to be Jan. 1, right? It could not possibly have been April 1. This is shaping up to be a tough spring, with a much colder start than many of us can remember. That snowstorm will make the already thick ice more difficult to deteriorate. In short, we’re sick of this stuff and want some warm weather. We are still looking at as much as 28 inches of ice on lakes in the North Woods, with a little bit of slush in spots. There still is no major warm-up in the forecast, so we will be ice fishing for a few more weeks. 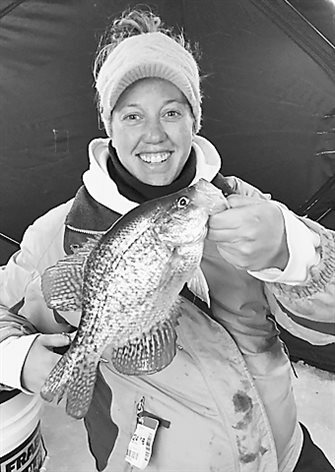 The best late-ice panfish action is yet to come. Bluegill fishing has been good and will get better as it warms. These fish are mostly in the weeds, and will inhabit dead weeds also. They are hitting on waxies and spikes in these weeds. Use very light tackle for these guys, as they can be quite spooky. At times we hear of the bigger fish feeding off the weeds. These fish are usually feeding actively. It looks like another cold week for us here in the North Woods. With these cold overnight low temperatures, whatever ice melts during the day refreezes during the night. We are still looking at 30 or more inches of ice on our area lakes. The good news is that the slushy spots are not nearly as bad as last week. Many anglers are still driving trucks out on the lakes, although we do not recommend it. Just remember that no ice is 100% safe, especially this time of year when ice conditions can change very rapidly. Well here we are in mid-March, when the weather can turn really nice and the high temperatures can even hit 50 degrees on some days. Maybe that will happen, but it certainly has been a slow start to warmer weather, and from this viewpoint, it looks like a slow spring and a late ice-out period. That can change, of course, but it certainly looks like a lot of ice fishing ahead. North Woods lakes still have a lot of ice, as much as 35 inches on some lakes. It will take a long time to melt that much. For about the next two months, these reports will be much shorter than during the game fishing season. That season ended Sunday, and we are restricted to panfishing until the open-water opener on May 5. The good news is that the panfishing is great from this point forward until the ice leaves, so we can still enjoy some great fishing. A very significant increase in the snow load on the ice has resulted in some more slush problems on lakes throughout the area. It is harder to get around out there at this point, but expected warmer weather this week will reduce that snow on the ice and make it easier to access area lakes. The lake ice is getting thick and is closing in on 24 inches. What a winter it has been. Anglers are running out of time to fish for game fish, as that season ends this Sunday. After March 4, they will just be able to fish for panfish. As we head toward the later part of winter, the cold weather has abated somewhat and it has been much more pleasant for anglers on the lakes. This has allowed more people to get out there and enjoy some ice fishing. Getting around on the lakes has been great. There are snow roads on many of the bigger lakes, but be careful for “snow dunes” if you are driving. With all the wind we have had recently, there are some dunes, especially on the bigger lakes. The fishing has been pretty good, but the continued cold weather has seriously hampered anglers’ efforts to be comfortable out there and has kept the number of fishermen down considerably. But it is expected to warm up this week and we hope that those forecasts for temperatures in the 30s are accurate. It is always nice to see families out on the ice and to see kids getting a chance at tip-ups. Once again the North Woods received a new snow load on the ice, but this one doesn’t seem to have created a lot of slush. The North has had enough cold weather to freeze a lot of the slush, so it is not too hard to get around out there. Many of the lakes have “snow roads” also, so anglers can drive out with comfort. As we get further into February, the sun will get stronger and the days longer, so we start thinking some of spring. There’s not a lot of time left in the game fishing ice season either, so soon we’ll be talking about that March panfishing. 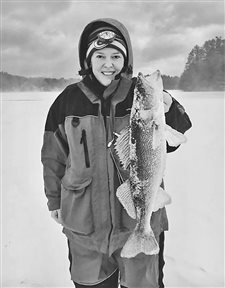 Anglers are once again blessed with that dreaded midwinter condition called lake slush. Most, if not all, lakes have slush at some level due to that heavy snow the North Woods received last week. Warm weather last Friday followed by colder temperatures Sunday and Monday have since firmed up some of the lakes. It seems to happen at some point every winter, but it sure makes it tougher to get around on the ice. We would sure recommend some waterproof boots for anyone going out. We finally got a good weekend for ice fishing and a lot of you took advantage of the weather to get out there. This is what winter is all about. It was great to see everyone enjoying themselves and great to see people also catching fish. In general, the fishing has been pretty good, with everything from walleye to panfish doing well. The North Woods could use some snow for the trails, but we really don’t want a huge snowfall for the ice fishermen because that will mean slush on the ice. Lake conditions have been pretty good so far, with anglers able to get around well. Ice thickness is from 12 to 18 inches. Once again, anglers have been confronted by difficult fishing weather as it has been too cold for most anglers to enjoy themselves on the ice. Boy, this has been a difficult winter so far. We’ve got pretty good ice conditions now as the ice is thick enough to drive on pretty much everywhere. Do, however, watch for current areas on the Chain of Lakes. Despite the cold weather, there have been the hard-core people out there and they’re doing pretty well. Make sure your auger blades are sharp as the ice is getting thicker by the day. The North Woods is finally getting some decent weather for a few days and this is the chance to get out and enjoy it a little. That prolonged cold front was miserable and way too long. It did, however, build some great ice on the lakes. We’re not seeing cars on many lakes yet, but we are seeing snowmobiles and four-wheelers out there. This means that anglers can get out to anywhere they want on the lakes. By the way, people should get to Eagle River to see the ice castle this year — it is great. We haven’t exactly experienced T-shirt weather for the last 10 days or so, but we’d sure appreciate seeing 20 degrees one of these days. At the sport shop the past week, we were shocked at the number of people who went ice fishing during the holidays despite the frigid weather. Thank heaven for shelters! The frigid cold has helped the ice build up during this period, with many lakes now having more than 10 inches of ice. This bodes well for the rest of the season as far as ice fishing goes. The slush on some lakes a couple of weeks ago is mostly frozen now. With this cold weather, we have much better ice thickness for both ice anglers and snowmobilers here for the New Year’s weekend. It seems we always get cold weather in January, so perhaps we’re getting that cold front early. At any rate, we do welcome the thicker ice for all users. We are now seeing many more people on the ice in the usual spots and it is nice to see. That means that we are getting more reports of their “take” when out there and learning some patterns. Anglers are finally getting into the ice fishing season with only OK ice reported on most lakes. The North Woods is getting too much snow and not enough cold at this point to improve ice conditions and the forecast is ominous. Lakes have the one thing that anglers don’t want early in the season — slush. With more snow, especially a heavy snow, we could be cursed with this slush for the remainder of the winter. While we are slowly but surely obtaining a snow pack, it is not good news at this point for ice anglers. We would prefer some more cold weather rather than snow to make more safe ice on the lakes. The cold weather has been helping, but that severe wind had an odd and negative effect on the ice. It even opened up a few lakes that had been closed. We’re looking at pretty iffy ice on many lakes. There is a little ice fishing going on at this point, but not a lot. It sure has been a weird early winter, just as it was a weird fall period. The weather continues to be inconsistent, with warm and cold intermixed consistently so that it doesn’t allow for development of good ice on the lakes. It’s early, so hopefully we will get some good ice development with cold temperatures predicted for this week followed by snow eventually. 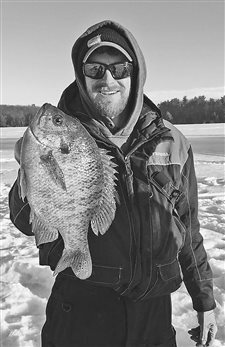 There have been a few ice anglers though, and they report decent northern fishing on the shallow weedy lakes where the ice development is going to be the best. Tip-ups with large shiners work best for these fish. We’re still in that transition period between the open water fishing and the ice fishing season. Calendar-wise, this is about the right time for transition. We sure would like some consistent cold weather now to thicken that ice cover. There are a few lakes that are still open but for the most part, the rest are all covered with ice but not necessarily safe to travel on. Every time the North Woods gets some snow, it melts within a few days due to warmer weather. This is probably good for ice development, as we don’t want snow on top of it yet. If you venture onto the ice, wear ice grippers on your boots, as it is very slippery now. There is not a lot of fishing going on right now for several reasons. The first is that it is the gun deer season and most folks are concentrating on that. The second is that we are between seasons as far as open water fishing and the ice fishing season. 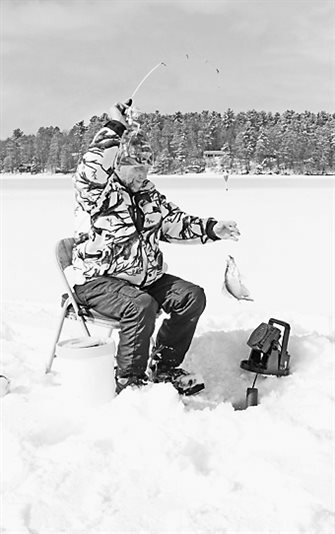 The North Woods does have ice on many lakes, but the ice is not good enough for safe fishing. We keep having these warm days interspersed with the cold, so don’t trust that ice yet. 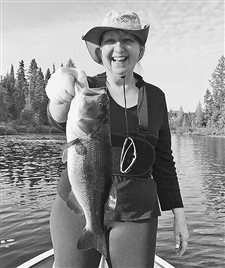 There are a few small lakes that anglers have gone on. Take safety spikes and spuds along to test the thickness. In a dramatic turn late last week, the cold weather overcame most lakes in the area and most of them iced over. It seemed early, but that was mostly because it had been so warm before the cold front hit the area. With slightly warmer weather in the forecast this week a few lakes might reopen, but we think the ice fishing season is on the cusp before deer season is here — maybe. We’ve also had a lot of snow and that snow will help the deer hunters. We are sure getting to the end of the open-water fishing season quickly, as these water temperatures are dropping like rocks. Lakes had water temps down to 35 degrees last weekend, so unless we get a profound warming trend, ice fishing is not out of the question on some lakes in the next several weeks. We’ll see. The big drop in those water temps did not bring the amount of muskie action that we hoped for, as it seemed like the fish were stunned by the rapid drop in those temps. 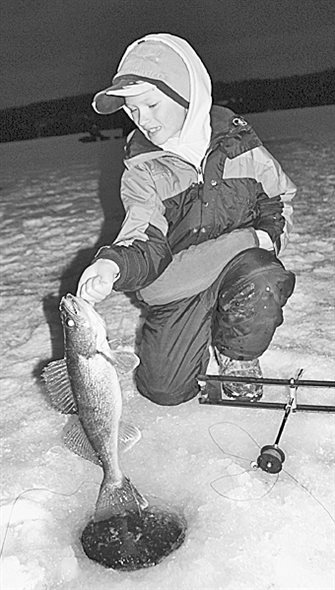 The muskie fishing season runs through Nov. 30, but some lakes may freeze over before that. Wow, what a reversal in our weather patterns! We went from early fall weather to late fall weather in one day last week, and that late fall pattern is sticking with us. Virtually all the leaves are gone, giving the deer and grouse hunters good sight lines. The snow doesn’t stay at this time of year, but it sure makes a mess for a day or two. With late fall on the horizon, the fishing is really good across the area for walleyes and crappies, and should get better for muskies. The water temperatures took an unfortunate jump with that warm weather last week, but the fishing held up pretty well during that period. The water temps that were back to the mid-50s have started to fall rapidly. 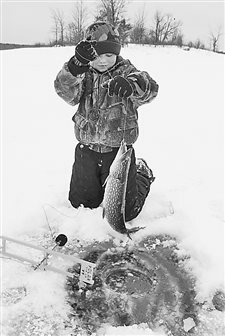 With much colder weather this week, the fishing should be in the very good range. Lake levels are very high. The days have become much shorter now, making it tough to get out with daylight left after working during the day. We are sure seeing the weather make some moves toward late fall in the last week or so. The nights are now cold, no matter what happens during the daytime. When combined with the cold weather and rain, it really drops those water temperatures. Speaking of the water temps, we now have them solidly in the 50s on all but a few lakes. That rain Sunday also dropped a good portion of the leaves still on the trees. Now it also looks like late fall. Well, it’s finally starting to feel and look a little like fall in the North Woods. It’s about time, as we’ve had periods of inconsistent weather for the last two months. The lake levels remain high with all the rain we’ve had, including more than 2 inches last weekend. To our knowledge, all boat landings are in pretty good shape with this high water. The North Woods is still not getting normal fall weather, as it seems to swing from too warm to too cold on a weekly basis. We’ve only experienced one freeze so far, but many lakes have turned over recently with those two cold nights. For the sake of fall fishing, we’d like to see it get consistently colder and stay that way for the great fall walleye and muskie fishing. In the words of Vince Lombardi, “What the hell is happening here?” We’ve got falling leaves, some loons have left, the geese are flying south — and it is almost 90 degrees! Many of us felt during the cold weather this past summer that this very thing would happen; that we’d get our fill of warm weather just when we didn’t really need or want it. Once again we are blessed with unseasonal, very warm weather for this time of year. While this is great for almost all activities, it is typically no good for our fishing. With water temperatures going up at this time of year, it is very confusing for the fish. The weather roller-coaster ride continues as we are being treated to some above-average warm temperatures this week. Last week, we started to think we were in for an early start to a cold fall, but this week summer has reappeared. With colder temperatures this week, fall weather is upon us. Where did the summer go? It has been cool throughout the last few weeks and the nights have been downright cold in some cases. The water temperatures have dropped into the 60s through­out the area. The days are getting much shorter, so even when we have sunlight it is not raising those temperatures much. What we need around here is a little rain. Just kidding. We’ve had a lot of rain and this rain was a cold one, dropping the water temperatures down to a point of being unusually low for this time of year. This has been a strange summer, with a few warm fronts, all interrupted by one cold front after another. It will be interesting to see what happens as we get into fall. My fear is that in September, when it is supposed to be cooler, we will have an extended warm period that will really mess up the fishing. We’ll see what happens. The freight train that is fall is coming down the tracks pretty quickly now, with the cooler nights and colder water temperatures indicating its imminent arrival. The days are getting shorter now, and while we are going to get some warm weather, the general trend will be cooler from this point forward. We’ll start thinking of that great fall fishing coming our way for walleye, crappie and muskie. As we head through August, we’re getting into that late summer fishing that can at times be a grind. The lakes have never reached their normal summer temperatures this year, but they are still looking a little “worn” around the edges in many cases. You’ll see a fair amount of scum back in the bays which makes it hard to fish those lily pad areas. If we are going to get outbreaks of “green water” on whole lakes, this is the time. Fortunately, this year has been pretty good due to the colder water. Midsummer fishing patterns are dominating the fishing news this week, despite the cold front that came through last week. Maybe the fish are getting used to those cold fronts, as the water temperatures again went down measurably, with a drop of 5 degrees or so on the surface. 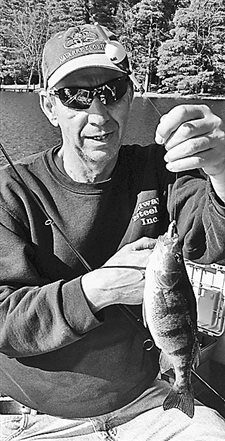 Midsummer fishing patterns are on tap for all who go out now, with those climbing water temperatures, more weed growth and high boating traffic. The North hasn’t had much in the way of rain for going on a month now, so the lake levels are falling some. Weed growth is excellent on all lakes. Water temperatures are in the 70s throughout the area, with a few lakes even reaching the 80s. Cool nights have been great, but the daytime temps have been pretty high. As you all know, it’s been a very unusual summer. We’ve had alternating cold fronts with warm weather, topped by very rainy periods along with dry spells. This weather has made the fishing difficult in many cases, as the fish are just not reacting well to this inconsistency in the weather. Water temperatures have reached the 70s finally. Well, once again we had a cold front go through and lower the water temperatures by 5 degrees or so. We just can’t seem to get normal weather this summer. With the water temperatures finally warming into the 70s, lakes are now getting into closer-to-normal summer conditions throughout the area. Water levels are still high, but falling a little. Weeds are growing and adapting to the higher water levels. Most boat landings are in very good shape despite the high levels. Here we are in July and the water temperatures are still in the 60s. We have a lot of catching up to do on those temps and on the weed growth that comes with warmer temps. Extensive rains have caused all lakes to be high — some at the highest level in anyone’s memory. Trout streams are equally high. One good thing: those streams are getting flushed out nicely. The weather sure has been stinky. We just can’t seem to get rid of the cold fronts this summer. These repeated cold fronts have had a massive effect on the water temperatures, as this last one dropped the temps by five degrees or so. Water, water everywhere. The North Woods has been afflicted, again, by a bunch of rainy weather. As a result, the water temperatures have yet again taken a drop due to the rain and the cold front that came with it. If you drive around the area, you will see water where you have never seen it before, and the lakes and rivers are all very high. What a year so far! Summer weather is finally here, with extremely warm weather that has brought the water temperatures up to almost normal. It happened so fast. Of course, it also brought an epic mosquito hatch and that dreaded pine pollen attack for those of us who suffer from allergies. The North Woods is finally getting some actual summer weather and it has been great for all of us. We’ve had enough rain to last for some time and you’ll notice that the ditches and streams are still quite full. We certainly have had a spring of inconsistent weather here in the North Woods. This has had a major effect on our fishing, as the water temperatures are significantly below normal. Cold, windy and raining — what a crummy bit of weather! Once again, the North Woods received some really bad weather right through last weekend. This bad weather dropped the water temperatures by as much as 10 degrees on area lakes, and for the most part shut the fishing down over the weekend. The weather has been gradually improving and the water temperatures should be on the rise if we get some warm nights. Water temperatures are getting better with a much stronger sun, and there is some nice weed development starting on many lakes. All spring now we have been bothered by inconsistent weather, with a few good days interspersed with cold and unpleasant weather. What a spring, so far. We’ve had everything from 75 degrees and sun to multiple snowstorms — and rain, a lot of it. The lakes are high, full of water to levels we haven’t seen for years. Don’t put those snow shovels away yet, folks. It’s a spring with both cold fronts and warm fronts. There was even a little snow in the air Sunday morning keeping the water temperatures in the upper 40s. The North Woods is still on that spring roller coaster of weather, having experienced almost summer-like weather and significant snow in the last week. With the recent rain and wind, the ice is gone on all lakes. Pretty early for that, but certainly welcome to most of us. 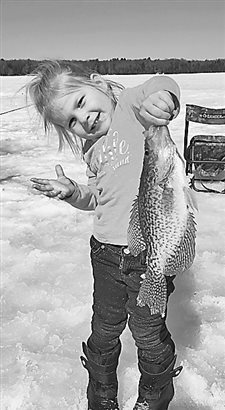 We never got to do a lot of that late-season crappie fishing we like so much because the ice went out so quickly. We certainly had some nicer weather late last week and on the weekend. The warmer weather got rid of a lot of the ice on lakes in the area, although not all are ice-free at this point. Nevertheless, spring is here for anglers. The loons are back and we’ve seen some geese and ducks in the area. When you go outside, there are birds we haven’t heard since last year. With our spring weather getting ever nicer, I have one piece of advice for everyone — don’t put those snow shovels away for the year just yet. The North Woods is just bound to have a big snow before May rolls around. The waiting game before spring really arrives seems to be taunting us. It’s a tough time up here. The North Woods has had enough rain, wind and messy weather to last — it seems — a lifetime. The weather is ever so slowly warming as we head toward the end of March, but it has been a tough month for everyone. We had that false sense of spring in February when it got so warm, but it has been cold since then. For the past week, at least in the fishing world, we don’t have a lot to talk about. That absolutely miserable weather we had in the last week kept people from getting out and enjoying our late-season ice fishing. 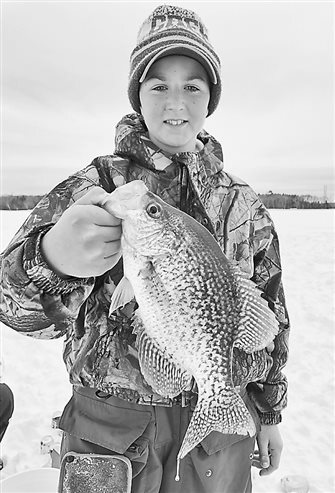 The game fishing season is over and anglers are limited to panfish for the rest of the winter and spring. 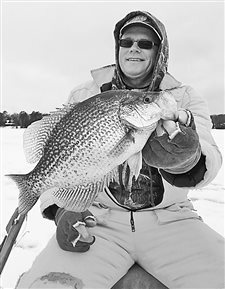 Well, anglers have only a weekend left in the game fishing season before they are limited to just fishing for panfish. The game fishing season comes to an end this Sunday, March 5. The North Woods continues to have unusual winter weather, as we have lost much of our snow and some of our ice due to the unbelievably warm weather the past week.